Perfect gift for my wet nose friends. We all love to wrap ourselves in a cosy warm blanket. They all made out of high quality fleece fabric. You have a choice of five different colours. 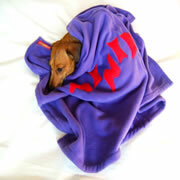 Personalise this luxury blanket with your dog's name. Just email us the name and we will sew the name as you see in the picture using felt fabric.